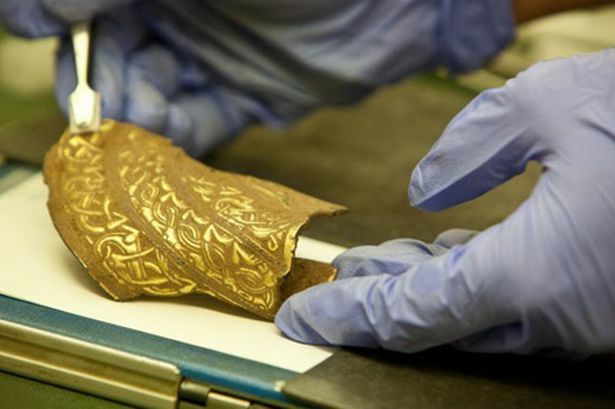 Birmingham Museums’ Staffordshire Hoard Conservation Programme has been shortlisted for an international award. The International Institute for Conservation (IIC) Keck Award is presented every two years ‘to the individual or group who has contributed most towards promoting public understanding and appreciation of the accomplishments of the conservation profession’. The Hoard is competing against conservation projects in Canada and the USA for the award, named after New York couple Sheldon and Caroline Keck who are widely acknowledged for advancing restoration and conservation techniques in the mid-20th century. The Staffordshire Hoard is the largest hoard of Anglo-Saxon gold and silver metalwork ever found. It was discovered in a field near Lichfield in July, 2009, by metal detectorist Terry Herbert from Burntwood, Staffordshire. It was valued at £3.2 million and was bought by the Birmingham Museum & Art Gallery and the Potteries Museum & Art Gallery. On its website the IIC says: “The Hoard programme represents a new paradigm for archaeological conservation. “The idea of carrying out conservation in the public eye is not a new one. Where the Hoard programme has been unique is the intensity and regularity with which it was able to provide outreach and that the social media has gained an international audience which has been sustained over the years. “This programme also significantly differs from other archaeological projects due to the inspired decision to keep the Hoard on display throughout conservation and research, which is unlike any archaeological project before it. The Hoard is competing against The Chinese Freemason’s Lantern Public Conservation Project at the Royal British Columbia Museum in Canada and The W. Brooks and Wanda Y. Fortune History Lab at the Eugene and Marilyn Glick Indiana History Center in Indiana, USA. Simon Cane, Deputy Director of Birmingham Museums, said: “We are delighted that the Staffordshire Hoard conservation programme has been shortlisted for this year’s Keck Award. “This international award recognises an individual or group who has contributed most towards promoting public understanding and appreciation of the accomplishments of the conservation profession. The 2012 award was given jointly to the Acropolis Museum in Athens, Greece, for the conservation and restoration of the Caryatids with the use of laser technology and Anglo-Saxon CSI: Sittingbourne in Kent. The winner will be announced at the end of July.